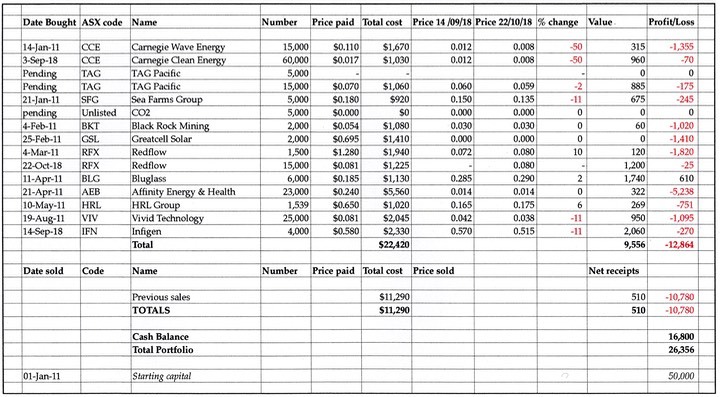 IF, LIKE THE GORMLESS GAMBLER, you put your hard-earned into buying shares in�“green” companies in Australia seven years ago, you won’t have saved the planet, and you have probably lost half your money. That’s assuming that, like the Gambler, you bought a range of environment-friendly�shares, �shoved them into the filing cabinet and ignored them for years. Guides to making money on the stock market tend to recommend rigid stop-loss rules,�such as selling a stock if the price drops 15 per cent, or 20 per cent, or whatever. �The trouble with applying that advice to tiddlers playing with the latest scientific research is that their share prices can drop 30 per cent over a couple of days and end the week up 50 per cent or more. �The spread between the buying and selling price may be only a cent or two, but that can be 10 or even 20 per cent of the price, so you don’t want to be trading in and out too often. But for the Gambler to sit back and do nothing while his shares in �Redflow (RFX) slid from $1.28 to seven cents really wasn’t very smart. His holding is now worth only $120, which is probably too small to sell. Instead of heaving a sigh and writing them off as expensive experience, the GG has bought 15,000 more shares in this battery battler. �It has cost him a total of $1,225 of good money, including�commission, and he could well be throwing it after bad. �He’s not called a gambler for nothing. However, Redflow’s problems seem to have been not so much with its innovative zinc bromine flow battery technology, but with the manufacturing and marketing. �The transition from research to commercial production and sales is often hard�— the skills, and personalities required, are quite different. Redflow now seems to be getting to grips with this. �The board has been rejigged, most recently bringing in additonal manufacturing expertise in the form of David Brant, who, among other things, had more than 20 years in senior management roles with Norgren, which manufactures automation equipment for a wide variety of industries. �He also knows the Redflow operation, because he was their vice-president for strategy and corporate development frm 2010 to 2012. Redflow’s chief operating offer, Richard Aird, has�stepped down from the board to concentrate on the manufacturing. Its new factory in Thailand managed to produce 78 batteries in August, but the hope is that this can be stepped up to 150 a month by December. �It reckons it could produce up to 250 a month if�necessary. Judging by its latest quarterly report, Redflow sells around $1.2 mln worth of batteries a year and spends about $13.5 mln more than that. � At the end of June it had some $17 mln in the bank, which will last little more than a year if they can’t step up sales significantly. Since the company commissioned an external strategic review early last year, there have been a series of board and management changes, manufacturing of parts in the US has been switched to manufacturing of complete batteries in Thailand, and technical problems with the batteries have apparently been fixed. What has finally convinced the Gambler to plug more Redflow into his portfolio is the recent�“strength” in the shares. �While the stock market has been dropping sharply�— the all ordinaries index is down 5 per cent in the first three weeks of October�— Redflow shares are up nine per cent over the same period. �At the time of writing, would-be buyers were outnumbering sellers around the current price by about two to one.